The Danish Ministry of Agriculture now accepts that a writ of summons from the farmers association will once again delay publication of information about the pig farms that house the dangerous MRSA bacteria. The FOI-organisation Aabenhedstinget therefore asks the Ombudsman once again to intervene in this case and overrule the new exposure. 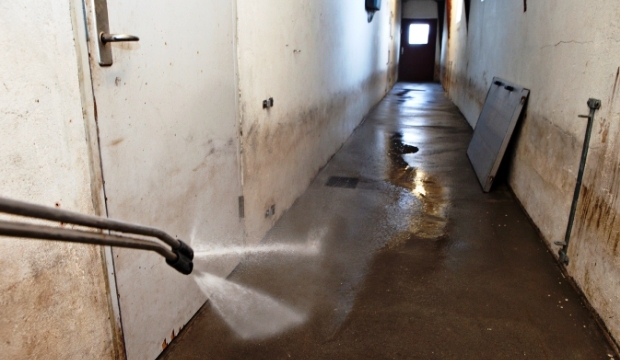 After delivery to the slaughterhouse the stable is flushed with high-pressure to prevent MRSA. “There are no new arguments from the farmers. They have just screwed the boot in and sent a summons. It seems to have an impact on the Ministry, which has deferred their decision. We cannot see that there is any basis in the Environmental Information Act to allow an application to be the basis for a postponement of the decision,” says Aabenhedstinget in a submission to the Danish Ombudsman. Aabenhedstinget asked for the list of MRSA-infected pig farms March 14, 2012, after then Agricultural Minister Mette Gjerskov (S) mentioned its existence in a response to the Danish Parliament. After a relatively short processing, the Ministry refused, then Aabenhedstinget in May 2012 asked the Ombudsman to intervene in this case. The Ombudsman took more than two years to examine the case. His final decision came June 6, 2014, where all the Ministry’s arguments were rejected. Aabenhedstinget therefore asked again to obtain all the information from the ministry and later to Danish Veterinary and Food Administration, DVFA (Fødevarestyrelsen in Danish). On June 17, 2014 DVFA promised to reply within 18 working days. Just before the deadline summoned the peasants’ interest group, Landbrug & Fødevarer, the Danish State on behalf of some of the owners of the infected farms. The organisation required information kept secret and demanded that the application had suspensive effect in the case. The requirements added DVFA for another stay of the proceedings sent to Aabenhedstinget July 11, 2014. It is this delay, which Aabenhedstinget now asks the ombudsman to act on. A version of this story in Danish can be found here.